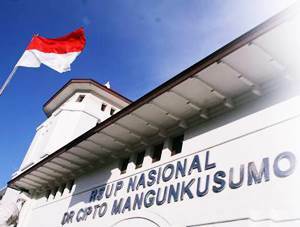 RSUP Nasional Dr Cipto Mangunkusumo - RSUPN Dr Cipto Mangunkusumo or referred to as "RSCM" is an established government-owned general hospital in Indonesia, based in Central Jakarta. The Hospital is owned and managed by the Ministry of Health of the Republic of Indonesia with management status of Public Service Agency (BLU). RSUPN Dr Cipto Mangunkusumo is recognized as class A Hospital in Indonesia. The Hospital also serves as a teaching hospital, one of which is the Faculty of Medicine, University of Indonesia (UI). RSUPN Dr Cipto Mangunkusumo is registered at Jl Diponegoro No 71 Jakarta Pusat. According to RSCM's profile as cited by JobsCDC.com, RSUPN Dr Cipto Mangunkusumo has a total land area 117,910 m2 and building area of 512,002.64 m2 spread in 5 locations, comprising Jl Diponegoro Jakarta, Jl Cik Ditiro No 6 Jakarta, Jl Cik Ditiro No 5 and 7 Jakarta, Jl Raden Saleh Jakarta, and Jl Adityawarman Jakarta (PKG). As of August 2015, RSCM has a total installed bed capacity of 1,033 beds. Background in Diploma Degree (D3) Nursing. Indonesian Citizen (WNI) with the maximum age of 35 years old on 1 December 2016. Graduated from an accredited university with minimum GPA of 2.50 (accredited A) and 2.75 (accredited A) within 4.00 scales. JobsCDC.com now available on android device. Download now on Google Play here. Please be aware of recruitment fraud. The entire stage of this selection process is free of charge. RSUPN Dr Cipto Mangunkusumo - Recruitment D3 Nurse Non CPNS RSCM December 2016 will never ask for fees or upfront payments for any purposes during the recruitment process such as transportation and accommodation.